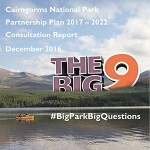 We consulted on the key issues to be addressed in the next National Park Partnership Plan 2017-2022. 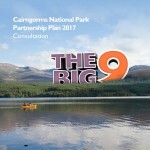 The Partnership Plan is the management plan for the Cairngorms National Park. It will set out how all those with a responsibility for the Park will co-ordinate their work to tackle the most important issues. It will identify an overall vision and strategy for managing the National Park, and will include priorities to which public bodies and other partners will direct their effort and resources over the next five years. This consultation did not try to cover everything that happens in the Cairngorms National Park. Instead it outlined the big issues on which we wanted views. You can find a summary of each of the 9 big issues that we consulted on, on the links below, or by following the links in the left hand menu. Following the end of the consultation, responses have now been collated and we will use this with partners to continue to develop the Partnership Plan. Download the Summary Report of Consultation Responses here (PDF | 2MB). We aim to submit a Partnership Plan to Ministers for approval in Spring 2017. We have carried out various assessments to support the development of the new Partnership Plan which can be accessed below.